We interrupt your regularly scheduled program to talk about the stars. I know next to nothing about stars. I've always enjoyed staring up at them, and with my trusty smart phone, I have a star chart at my fingertips, but the science is well beyond me. 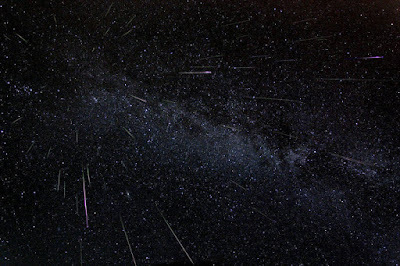 And then I saw a Facebook post from a local news station about a meteor shower. I'd never taken the time to step out into the night air and patiently wait for streaks of light. I'm not sure why. It's probably because I'm a bit lazy or easily distracted. But for some reason last night I took up the challenge. It was dark outside, so I figured dark enough if I was going to see anything, and I gave it a whirl. And I saw fire shoot across the sky. FIRE people. It was beautiful. Majestic. Awe-inspiring. And I'm not afraid to say that it brought a tear to my eye. Life is so very cool. So, so cool. There I was, sitting outside in my little backyard in the suburbs of Indianapolis where you can only see a handful of stars in the night sky. And four times over the course of an hour, a bright light streaked across the sky and dissolved into nothingness. Four times I shared a moment with other people across the country who might have been looking up instead of at a screen. I thought it would be a "I blink and it's gone." But it wasn't. 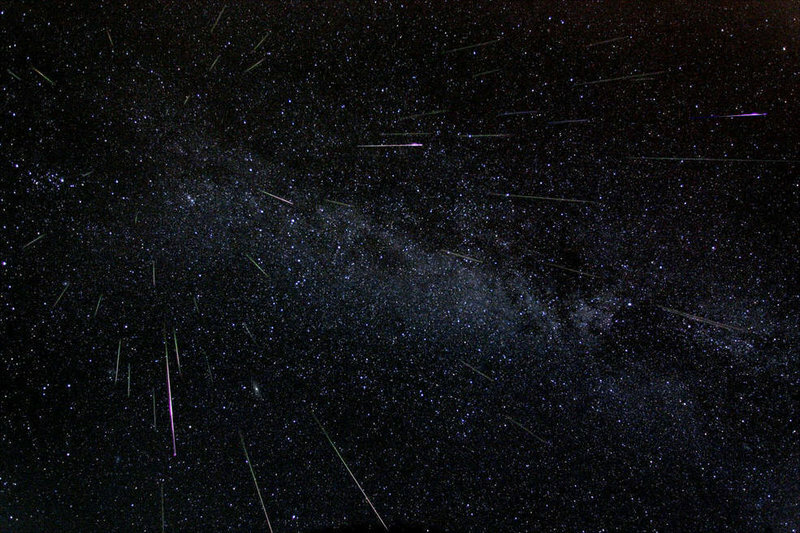 The meteors didn't linger, but were still dazzling. And at thirty-three years old I experienced my very first meteor. Something new on a random Wednesday in August. Then I started thinking. I was out there for over an hour and only saw four (this was definitely an exercise in patience). There was plenty of time to think. I started thinking about the shill in my toes as I stood on the dewy grass. I started thinking about how I needed a jacket and how I wished it was fall. I started thinking about Andy Weir's The Martian and how truly terrifying it would be to be the only human on a planet looking up at the night sky at Earth that is only a speck on the horizon. I started thinking about the movie Interstellar and how I really wished the resolution had been aliens, because I could have understood aliens. I did not understand the science. I started thinking about A.S. King's Ask the Passengers as a low-flying airplane passed above me. I sent them my love, because maybe, just maybe, somebody on the aircraft needed a nice little dose of affection. I started thinking about how precise our world is and how intricately it was created. If one thing got out of line, if the rate our spin, tilt of our axis, or position to the sun were just a tiny bit different we might not exist. I started thinking about how I pitied everyone tucked away in their houses not taking the time to stare up at the wonders. I started thinking about how I was most assuredly going to add the hunt for the perfect stargazing location to my bucket list. And I thought about how much I enjoyed the quiet, the peacefulness, and the moment just to be staring up at the stars. I hope that feeling stays with me for awhile. I hope I take more opportunities to just breath and enjoy stillness. And I hope there are many more meteor showers in my future. I hope they are in your future as well. We've got another chance to night, and you better believe I'll be out there in my little backyard looking for fire.